When 13-year-old Skyler, burdened with the responsibility of her four younger siblings, begins receiving mysterious phone calls threatening her family, she must race against time to save the people who matter most. Check out the film's IMDB page. Matt lives in New Hampshire with his mom, dad, brother, sister and cat. He has a passion for acting, filmmaking, and comic book history. Over the last year and a half he’s played lead and supporting roles in six college student films, a Hallmark film, an Italian restaurant commercial, a webtv documentary, and two stage plays. In his spare time Matt enjoys creating lego stop action animations, pivot animations, and home-made movies that he posts on his own Youtube channel. Maayan enjoys painting, drawing, and acting. She has some experience with acting and is excited to be a part of a movie! Maayan takes a drama classes and has been in a few school musicals, such as The King and I, Peter Pan, and The Little Mermaid. She also performs in a chorus. Liam is on the Student Council and likes lacrosse and flag football. Liam enjoys playing pranks and telling jokes! He is in the Boy Scouts and as of recently he likes to express his creativity and imagination through acting. Although Liam is a novice to the industry, he recently participated in a music video for a Boston Band, Gentlemen Hall (which will be released shortly). Liam takes direction well and really enjoys being in front of the camera exploring his emotions and telling tales! Shay Martin is a dedicated actress and aspiring Producer/Director. Shay's film credits include the role of the babysitter in "Countdown", and as an extra in the independent film "Theory of Conflict". She also performed as part of a chorus, and in small productions of "The Wizard of Oz", and "Charlotte's Web". She attended the Mansfield Music and Arts Society advanced acting summer program, trained with acting teacher Alice Springer, and has also organized several youth drama classes in her community for the past few years. Shay likes to keep busy with things like being a 4-H club Ambassador, Horse-Judging competitions, voice lessons, and horse-back riding. Leia is an aspiring actress. Leia has been studying acting for 2 years now. She has appeared in the three films made by the Jewish Girls Retreat summer camp (“One is Not A Lonely Number”, “Miracles & Meals”, and “A New Leaf”). Leia also enjoys photography, and was the behind-the-scenes photographer during Countdown filming. She hopes to further improve her acting technique and continue being a part of Fountain of Youth Productions. Audrey Larson is a teen actress, filmmaker, writer, and dancer. Audrey has also edited promotional videos for The Binah School, and Fountain of Youth Productions and a short documentary on Fair Trade. As an actress; Audrey has had supporting and principal roles in several films by Jewish Girls Retreat, and has also appeared as an extra in several independent films, a web-series, and the HBO mini-series "Olive Kitteridge". Audrey also did the lead voiceover for a book trailer, One is Not a Lonely Number. She has trained privately with acting coach Alice Springer, and attended workshops at Boston Casting and C.P. Casting. Sarah attends Laurel Springs online school. Sarah loves acting, art, ice-skating, and fashion. She came on board for Countdown as the Associate Producer, Costume Designer, and Makeup Artist/Hair Stylist. Sarah takes regular classes in acting, iceskating, and ballet. Channah likes reading, writing, and acting. She is in 10th grade at The Binah School in Sharon, MA. 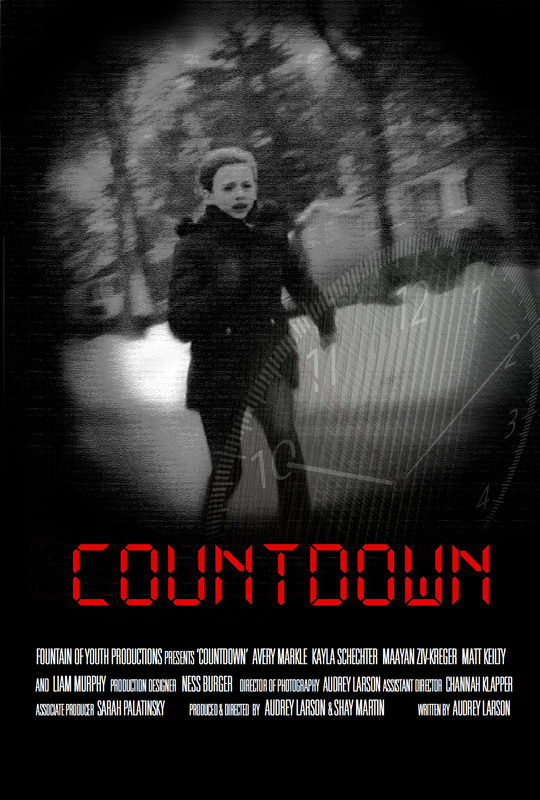 Channah is the Assistant Director of Countdown, which she originally auditioned for a role in. She has been looking for acting opportunities since she became interested in acting through a school play several years ago. She currently takes a drama class. In her free time Channah enjoys playing with her pet hamster, working on her novel, and reading The Lord of the Rings (again). She is hoping to learn a lot more about movie production with FYP!